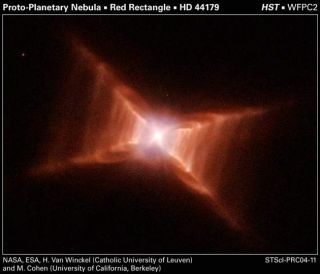 The Red Rectangle nebula is 2,300 light years from Earth in the constellation Monoceros. What appears to be the central star is actually a pair of closely orbiting stars. Particle outflow from the stars interacts with a surrounding disk of dust, possibly accounting for the X shape. This image spans approximately a third of a light-year. The universe is not empty. The space between stars and between galaxies is permeated by gas and dust. In fact our solar system is currently experiencing a cosmic dust storm with at least three times as much dust passing through compared to just a few years ago, owing to a periodic weakening of the sun's magnetic field. And sometime in the next 10,000 years, we'll plow through the G-cloud, a region of dust more dense than the one we're in now. Astronomers have struggled for a conclusive answer as to where all this dust comes from. "We not only do not know what the stuff is, but we do not know where it is made or how it gets into space," said Donald York, a professor of astronomy and astrophysics at the University of Chicago. York and his colleagues have now identified a fountain of dust that appears to be just the sort of culprit they have been looking for. The dust factory is a double star system, designated HD 44179, that sits within the strikingly beautiful Red Rectangle, an oddly geometric cloud of gas and dust located 2,300 light-years away. One of the double stars in the Red Rectangle is a type astronomers figure produces dust. It has burned all the hydrogen in its core, so it can no longer support the primary form of thermonuclear fusion that powers other stars like our middle-aged sun. These post-AGB (post-asymptotic giant branch) stars, as they are called, collapse and then generate enough heat to burn a new fuel: helium. During the transition, which takes place over tens of thousands of years, a star like this loses an outer layer of its atmosphere, York and his colleagues explain. Dust is thought to form in this cooling layer, which is pushed outward by the star's radiation pressure. In double-star systems, material is often shared, or pulled from one star to the other. A disk of material from the post-AGB star can form around the second smaller, more slowly evolving star. "When disks form in astronomy, they often form jets that blow part of the material out of the original system, distributing the material in space," York explained. This is what the researchers think they observed in the Red Rectangle. The discovery, to be detailed next month in the Astrophysical Journal, has wide-ranging implications, the researchers say, because dust is critical to scientific theories about how stars form. "If a cloud of gas and dust collapses under its own gravity, it immediately gets hotter and starts to evaporate," York said. Something, possibly dust, must immediately cool the cloud to prevent it from reheating. The giant star sitting in the Red Rectangle is among those that are far too hot to allow dust condensation within their atmospheres. And yet a giant ring of dusty gas encircles it. Witt's team made approximately 15 hours of observations on the double star over a seven-year period with the 3.5-meter telescope at Apache Point Observatory in New Mexico. "Our observations have shown that it is most likely the gravitational or tidal interaction between our Red Rectangle giant star and a close sun-like companion star that causes material to leave the envelope of the giant," Witt said. Some of this material ends up in a disk of accumulating dust that surrounds that smaller companion star. Gradually, over a period of some 500 years, the material spirals into the smaller star. Just before this happens, the smaller star ejects a small fraction of the accumulated matter in opposite directions via two gaseous jets, called "bipolar jets." Other quantities of the matter pulled from the envelope of the giant end up in a disk that skirts both stars, where it cools. "The heavy elements like iron, nickel, silicon, calcium and carbon condense out into solid grains, which we see as interstellar dust, once they leave the system," Witt explained. Cosmic dust production has eluded telescopic detection because it only lasts for perhaps 10,000 years — a brief period in the lifetime of a star. Study hundreds of stars, and the odds are long you'll find one in this phase. Astronomers have observed other objects similar to the Red Rectangle in Earth's neighborhood of the Milky Way. This suggests that the process Witt's team has observed is quite common when viewed over the lifetime of the galaxy, which is several billion years. "Processes very similar to what we are observing in the Red Rectangle nebula have happened maybe hundreds of millions of times since the formation of the Milky Way," Witt said. Why is the Red Rectangle Red? Why is the Red Rectangle So Geometric?